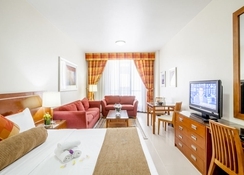 Golden Sands Hotel Dubai is a luxurious hotel apartment located behind the Burjuman Shopping Centre, in the heart of Dubai. With convenient self-catering, bed & breakfast and half board options, this 4-star hotel offers its guests first-class facilities, accommodation and friendly service amid warm Arabian-inspired interiors. Golden Sands Hotel's facilities include an outdoor swimming pool, fitness amenities such as a gym and sauna, plus the Golden Sands Restaurant, plus the hotel is within close proximity to the city’s main attractions, including the sandy beach, popular malls, museums and more. The spacious apartments are tastefully furnished and can be rented on both a short & long-term basis, with an array of services to ensure guests have a comfortable stay. 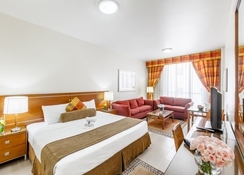 Golden Sands Hotel Apartments Dubai is strategically located behind the Burjuman Shopping Centre and is within close proximity to the Burjuman Metro Station and Al Fahidi Metro Station. The Dubai World Trade Centre is just 5km away and most of the city’s attractions are close by. Dubai International Airport is 8km, so your transfers should be hassle free. 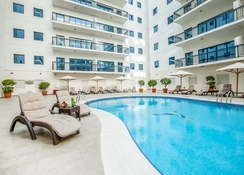 Golden Sands Hotel Apartments Dubai offers 616 rooms that are categorised as Studio Golden Sands 3, Studio Golden Sands 5, Executive Rooms, Executive Suite, Family Suite, One Bedroom Suite, Two Bedroom Apartment Deluxe, Two Bedroom Apartment Premiere, 3 Bedroom Apartment Deluxe and 3 Bedroom Apartment Premiere. Guests can choose from the stylish 1, 2 and 3 bedroom studios, which are well suited for individuals, couples and families. Each room is elegantly furnished and includes a direct dial telephone, satellite television, digital safe, washing machine, seating area and a fully equipped kitchenette with refrigerator and microwave. There is also daily housekeeping and room service facilities available. The hotel offers self-catering, bed & breakfast and half board services, or for those that do not want to cook, there are fantastic restaurants nearby. The Golden Sands Restaurant is open 24/7 for breakfast, lunch and dinner, plus there are Lobby Lounges offering refreshments including afternoon tea. 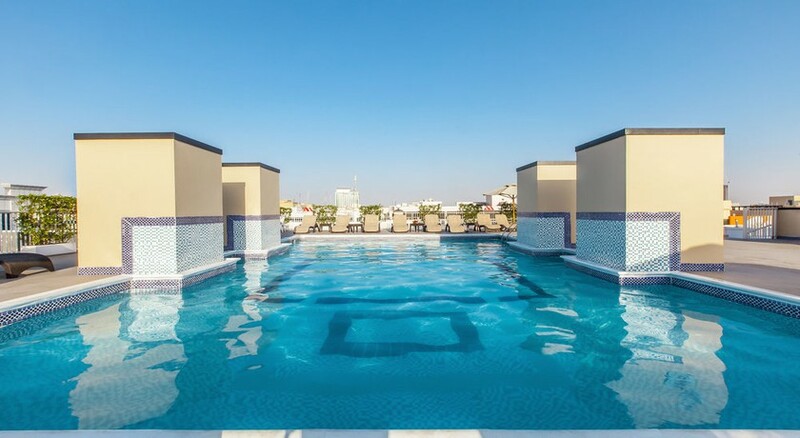 The Golden Sands Hotel Apartments Dubai has a swimming pool, sun terrace, and plenty of fun fitness facilities including a gym and sauna. If you fancy a day out beyond the hotel walls, Golden Sands also arranges sightseeing tours of Dubai, ensuring you tick off all the nearby attractions! Guests can contact the excursion desk located in the lobby of the hotel. Golf enthusiasts can tee off in style at the nearby golf course (3km).